Longhorn catcher Levi Montero, far right, uncorks perfect peg to shortstop Yazael Nuñoz to nab attempted steal by King base runner. 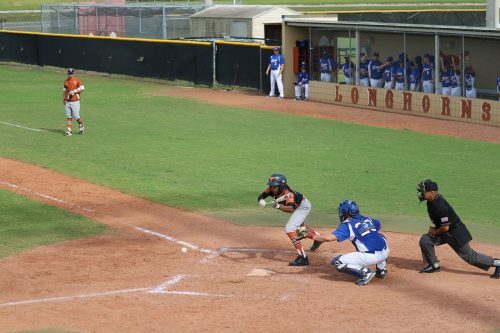 Coach Kennedy Duran’s Lennard Longhorns continued action in the Saladino Tournament, hoping to move to the final round of the baseball tourney at Brandon later this week as a pool winner or as a wild card. Lennard’s next regular season game is March 26 at East Bay at 7 p.m. Then Brandon comes calling for a district match-up on Thursday, March 28 at the Longhorns’ diamond at 7 p.m. The Longhorns split two games to open the Saladino tourney over spring break and were playing Newsome on a rainy Tuesday afternoon with results not available before The Observer News deadline for printing. Lennard bounced back on Monday, March 18, to hold off the Carrollwood Day School Patriots 4-3 after building an early lead and almost blowing it by going flat offensively. The Longhorns tallied a pair of runs in the opening inning and two more in the fourth before Carrollwood made it too close for comfort with a three-run fifth. Lennard’s Randy Tavares answered the call to the bullpen with one out in the fifth to save starter Cameron Lassalle’s quality star. Tavares provided a boost for the Longhorns by closing the door on the Patriots outburst and for the rest of the game. Lennard’s season record went to 6-1 heading in to the Newsome game. Carrollwood fell to 3-8 with another tourney round against King on Tuesday. 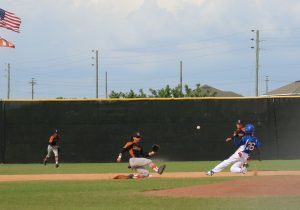 Hayden Hensley had two hits and an RBI for Lennard and Francisco Alaniz knocked in a pair of Longhorn runs. 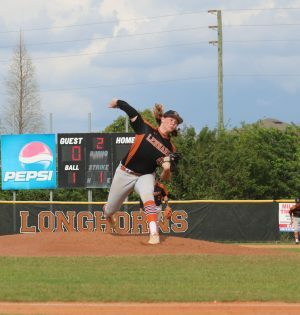 The Saladino defending champion King Lions only managed one hit off three Lennard pitchers Saturday afternoon but turned it into 2 unearned runs to knock the Longhorns from the ranks of the unbeaten in a 2-1 squeaker before a large crowd of spectators at Longhorn Field. The heartbreaking loss left Lennard at 5-1. Lennard’s Edward Tarrant delivers a fastball to a King batter in the Saladino Tourney in the Horns’ 2-1 loss Saturday. Edward Tarrant started on the mound for Duran’s Longhorns who were designated as the visitors for the tourney game. Tarrant went 4 innings, whiffing 7 but walking 7. Fransisco Alaniz and Hayden Hensley closed out the Lions in the fifth and sixth, yielding no runs on no hits. Yazael Nuñez collected Lennard’s lone RBI in the Longhorns’ last at bat in the top of the seventh, too little and too late. 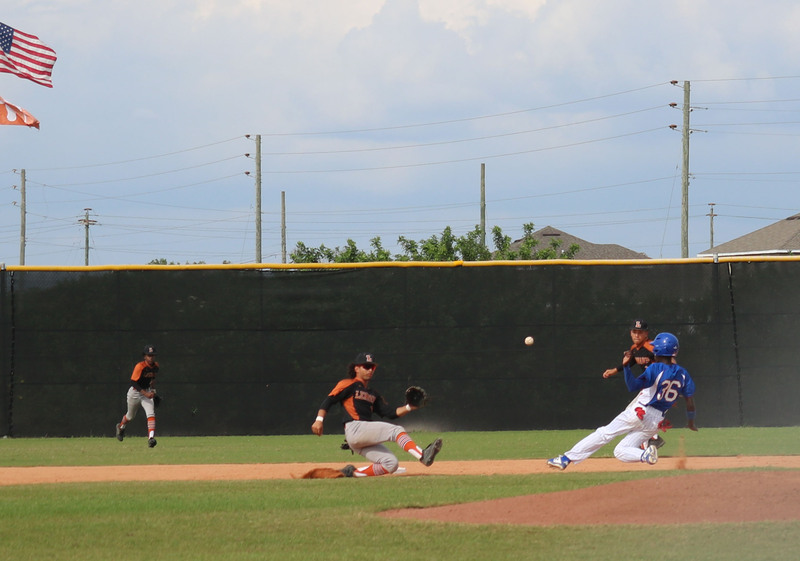 Alaniz and Hensley were the only Longhorns to collect base hits for Lennard with Alaniz scoring the only run. King got a gem itself from its hurler, sophomore Matthew Johnson, who was lifted in the seventh after only surrendering one earned run, striking out 5, issuing 5 free passes and hitting a batter. Johnson got the only hit of the game for the Lions.